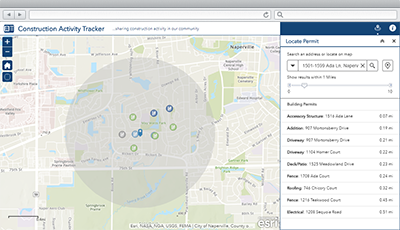 Construction Activity Tracker is a configuration of Web AppBuilder for ArcGIS that can be used by the general public to track individual building permits and general construction activity. The application can be deployed by a local government and used by the general public to locate open, under review, approved, and closed building permits. To deploy Construction Activity Tracker with the ArcGIS Solutions Deployment Tool requires specific software. To manually deploy Construction Activity Tracker in your organization requires specific software. Application Construction Activity Tracker An application used by the general public and other interested parties to review the status of construction activity in their community. Map Construction Activity Tracker A map used in the Construction Activity Tracker application to review the status of construction activity in their community. Feature layers ConstructionActivity A feature layer used to store building permits and other construction related activity in the community. ConstructionActivity_public A public feature layer view of the ConstructionActivity layer used to share information about building permits to key stakeholders and the general public. Below are the release dates and notes for Construction Activity Tracker.